Please be aware of dangerous rip currents that occur throughout the beach at different times during the day. Educate yourself of the dangers of rip currents and ask your lifeguard of possible areas to stay away from before entering the water. Always swim near a lifeguard and do not swim when guards are not on duty. "When in doubt, don't go out!" The beaches of Wildwood Crest serve as a popular vacation destination for tens of thousands on any given day during the summer months. As a result, young children often get confused of their whereabouts when returning from the water. When you notice that your child has gone missing, immediately inform the lifeguard on your beach. Give them a detailed description of your child and they will relay that information to the rest of the staff throughout the beach. When your child is found, lifeguards will collaborate to return the child to his/her family. 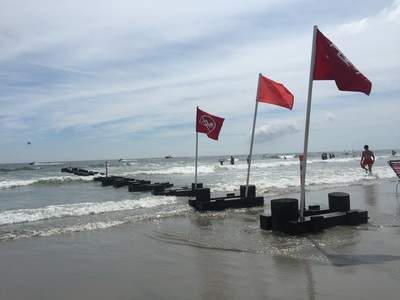 Please be aware of red "No Swimming" flags located throughout the beach. These flags indicate areas that swimming is not permitted. 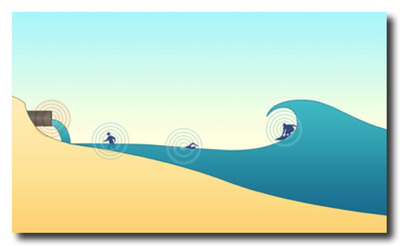 Such reasons could be due to high rip current areas, surfing only water, or outfall pipe locations. If you are unsure whether or not an area is safe to swim, please ask your lifeguard before entering the water. Outfall pipes are located at certain streets throughout the Wildwood Crest beach. These areas can potentially be dangerous for bathers, especially during high tide when the pipes are not visible. Be aware of the location of the pipes before entering the water and make sure to stay clear of areas marked with red flags.